P2PU | Making Writing and Literacy Learning Connections | July 9: What writing and literacy learning connections do you make? ›July 9: What writing and literacy learning connections do you make? Good morning and happy July 9th! As this the first day of our Making Writing and Literacy Learning Connections study group we would like to kick things off, writing project-style, with a common prompt to get the juices flowing and help us get to know each other a little better. You are welcome to write prose, brainstorm notes, mindmap, draw ... whatever is best for you! Frank Romanelli, a participant in this study group, introduced himself upon joining with this video which shares the connections he is making when thinking about literacy and learning. What writing and literacy learning connections do you make/strive to make in your work and practice? What possibilities do you see as well as what challenges or questions emerge? Servando July 11, 2012, 7:19 p.m. Sorry I joined the discussion so late. My name is Servando Ortega, and currently I am categorical program advisor who serves the needs of majority of Tilte I and English Language Learner Students a Public School Choice 1.0 in Los Angeles, CA. The writing and literacy connections that I have entails my work and interest develop literacy and language skills among language learners. A major goal for English Language Learners is to simulatenoulsy develop their literacy skills as well as they acquiistion of their second language. In order to serve these needs, picture books are essential. Not only do picture books serve as a model of language for language learners as source of vocabulary development, as well as model of form and function, and ultimately to be used as mentor text as langauge learners develop their writing skills. Lately, I have been interested in the use of technology, especially Web 2.0 tools, to give our writers a purpose and audience to display or publish their writing. I am looking forward to learning and collaborating among all of the talented individuals who have joined this lesson study group. Tellio July 12, 2012, 8:13 p.m. In Reply To: Servando July 11, 2012, 7:19 p.m.
Any particular collaboration you are looking for? Welcome. Some interesting background should enliven the discussion. KevinHodgson July 13, 2012, 5:18 a.m. Certainly one area of possibility for you to consider is digital storytelling, which infuses writing with personal experience for an authentic audience. Sheri Edwards July 11, 2012, 11:49 a.m. In Reply To: mratzel July 11, 2012, 10:26 a.m.
What a joy it is to meet you again here. As always, you are on the leading edge of educational reform, transforming your classroom to meet the needs of your students. I look forward to learning more from you here. You say you "don't get writing very well," and yet your blogs engage and encourage me to try new things and to reflect on my practice. For instance, your recent post, Moving to A Teacher Activator, emphasizes what my colleagues and I are also focusing on this year: "feedback, access to thinking, supporting challenging goals, and monitoring learning." We want students to think about their process and reflect on it, to grow in their repertoire of strategies and tools to solve the particlulars of their assignment choices. And the post, "Teacher leadership for common core harvest, filter, deliver," gives me ways to consider the Common Core State Standards our State has adopted: Harvest leaders to learn their style, Filter information for that style, and Deliver the information and strategies that fit each leadership style. I think I also need to do this in my classroom -- harvest the the classroom leaders, filter the standards into questions the leaders can understand, deliver the content of the standards in ways that meet the needs of the leaders and the rest of the class, with a collaborative and cooperative guide from the student leaders. It's a way to think of digital literacies as a shared learning experience for teachers and students. Janet Ilko July 11, 2012, 7:18 p.m. Welcome to the discussion! I wish every content area teacher realized we are all writing teachers, perhaps just a different focus. i write with English Language Learners and I look forward to discssing with you how your English learners may need additional support in using academic language in their writing. Tellio July 12, 2012, 8:14 p.m. Math is a language that we all need to learn. I look forward to being challenged by your scientific worldview. KevinHodgson July 13, 2012, 5:16 a.m. It's great to have you here. To see writing in isolation, just as to see math in isolation, seems like the wrong track for our world to have been on. What we need are more examples and exemplars of what good, solid writing looks like in the math class. I'm looking forward to your own explorations here. Janet Ilko July 11, 2012, 1:14 a.m.
Sheri Edwards July 11, 2012, 3:55 a.m. In Reply To: Janet Ilko July 11, 2012, 1:14 a.m.
Janet, How fortunate for your students to have a teacher that connects them to others in real ways so that they will want to write and learn. I look forward to hearing more about your project. My students have had some blogging experience and are looking forward to their own blogs next year. So, any tips you have, I'm anxious to listen. KevinHodgson July 11, 2012, 5:40 a.m.
You do great work! And I love the social justice element that infuses the writing and collaboration. Tellio July 11, 2012, 7:56 a.m.
You have a busy professional life. I am especially interested in your last paragraph and the questions you raise there. Sometimes it is the second blog post that tells you more about the writer than the first. You get an idea how they are integrating the new writing form. I think the follow up is a very powerful idea. Will you get them to do most of the work of growing the community of writers? I believe very much in the transformational energy of writing and wish you the best in answering and reporting back to us all of us about what you have discovered. Frank July 10, 2012, 11:06 p.m. I think that's great that so many of you are enjoying, sharing, and using the video. I also appreciate that Christina used it in her introduction. It is there to share so use it however you think it could be helpful. I also welcome everyone to look at my vimeo site: <www.vimeo.com/fromanelli>. There are some examples of student work, some screen captures of online class meetings and some video podcast lessons. The seminar I teach at URI, Writing in Electronic Environments, lends itself to great creativity and exploration. Some students rise to it better than others, but I try to foster a safe environment in which they can explore and learn. I let them know that failure is part of the process and try to focus my evaluation a balance between their growth in their use of Electronic Media and environments and their writing. We use etherpad and google docs (Drive) as a means for online writers' workshops where students collaborate on each other's documents with essential questions that I give them for each of their writing projects. I also encourage them to design their projects around their interests and their majors so that they are always making connections to their learning across the curriculum. I am continuing to learn and grow with each new semester and try to keep the conversation fresh. I am really enjoying all of the ideas and resources being shared here this week. it's fantastic! Thank you all for your contributions. By the way; after Mike and I finished the animation, I sent it to Dr. Crystal to make sure that he approved. He was very positive and also told me that he would be sharing it. In addition to his other comments, he said, "I really like the wink." Christina Cantrill July 11, 2012, 12:19 a.m. In Reply To: Frank July 10, 2012, 11:06 p.m.
And .... as one of the organizers of this group i can say that we really do want to support peer sharing and study, so thank you for getting us started there, Frank, and looking forward to learning more with you..
We clearly have a very open and engaged group of educators and writers here already thinking deeply and creatively about a full range of literacies and learning -- exciting. Looking forward to hearing from those we haven't yet and continuing the conversation with you all who have so nicely gotten things going. A note for the group: as per the outline we suggested for this group (see the overview here) we will begin Thursday to dig in further to literacy and learning connections via a set of broad related topics and resources from the NWP Digital Is website. In the meantime feel free to continue to converse, visit NWP Digital Is as well as the other resources you all mentioned ...and then respond to the new thread/task that will be started by Katherine on the 12th. Ultimately all threads will stay open so we can follow paths of interest. Tellio July 11, 2012, 8:13 a.m.
That is so funny about the wink. It is one of things I noted on the Vialogue annotation here at 00:49 seconds into it. There is a lot very cool echoing going on in that part of the video--the shape of the wink reflected right afterwards by the arch of the letters and then lastly in the sly wink of Dr. Crystal's eye in his portrait. It bears up to re-viewing and that is usually the sign of a very strong work. Thanks. Aaron Brown July 10, 2012, 3:59 p.m.
Hey! My name is Aaron, and I'm an instructor at a community college; the program I work for supports students who have not been able to pass our entrance assessment tests for reading, writing, and math. My job is to put together individualized courses of study for a given student, who works at his or her own pace until he or she is ready to retake the assessments. If I haven't completely screwed anything up, the student in question passes the assessment(s) and is free to enroll in for-credit coursework. The range of students I work with runs the gamut from younger people, just out of high school, who need a little extra attention, to older folks coming back to school after a lengthy chunk of life experience who need a refresher in grammar basics, math fundamentals, etc. My exposure to literacy / writing issues comes most often in the form of helping someone bridge the gap between communicating in writing to crafting in writing. All of my students can write some way, some how, but they don't have the tools to truly customize a piece of writing to a given context - work vs. texting vs. blogging, and so on. Virtually all students I work with feel that grammar and language structure are unimportant compared to making onesself understood. I find it exciting and challenging to show them how a strong understanding of writing fundamentals can help them do just that! Maryellen Ohrnberger July 10, 2012, 6:05 p.m. In Reply To: Aaron Brown July 10, 2012, 3:59 p.m.
Hi Aaron! I too work at the community college level in teaching those who fail the placement exams and need basic, college reading skills. What's even closer to the work you do is a current design project with which I am involved, and in the coming months, will hopefully become part of your tools to share with your students. It's part of a federal grant (http://www.doleta.gov/taaccct/) wherin I am creating non-credit course modules to assist those who are wanting to got into IT school/training, the requisit skills necessary to get into college. The three modules focus on decoding, vocabulary & functional/infomational text. My understanding is that they will become part of the Open, via NTER and be used anywhere by anyone needing it :) Hopefully, I get a chance to share the work directly w/ you someday! I'd love to hear more about your students and what they wtruggle with. The three areas we are developing these course for are reading, writing and math. Aaron Brown July 11, 2012, 11:42 a.m. In Reply To: Maryellen Ohrnberger July 10, 2012, 6:05 p.m.
Hey Maryellen! The topics we focus on are the same ones you're developing coursework for - reading, writing, and math. We also have a separate module for study skills, but it tends to be a little less stand-alone than the others; things like time management, anxiety management, etc, are usually lumped in with lessons for reading, writing, or math. One of the tools we use is an online-delivered curriculum our school purchased from Pearson. It tailors learning paths to individual students based on assessments they take to begin courses of study in the area(s) they need to improve. Once they are ready, they retake the college entrance tests (we use COMPASS). Anyway, I would love to see whatever you develop; we are always looking for ways to empower both instructors and students with flexible and adaptable tools. Keep me posted on your progress! Tellio July 10, 2012, 9:34 a.m. I uploaded Frank's Vimeo animation and voiceover to my latest tech toy, Vialogues. Here is the link to my annotations. You can join me in commenting in a way that is a little different. I invite anyone to also crowdcurate this grand 'text'. I have made it public for all. Hope that's OK, Frank. I am going to try to embed it below, but I doubt P2PU is set up to allow it. Sheri Edwards July 10, 2012, 6:46 p.m. In Reply To: Tellio July 10, 2012, 9:34 a.m. Thanks for the introduction to Vialogue! What a great format for sharing ideas based on a video. Think of the possibilities as we incorporate more video into our digital writing. Sheri Edwards July 11, 2012, 3:32 a.m. In Reply To: Sheri Edwards July 10, 2012, 6:46 p.m. This has been an interesting introduction, filled with many different issues. I needed to sort them out in my mind so I created this MindMap at MindMeister, Digital Literacies. I haven't added any actual "tools," but rather gathered together threads of conversation in this introduction. I wonder if it includes the issues we have discussed, as created through the filter of my experience, an expression of my own digital literacy. Some of you may be interested in a site I started last summer, which I plan to update this summer. Many of you have provided ideas from the tools we've used here and the discussions and questions we've started. Ask What Else provides strategies for our teachers new to technology, so they can choose one or two to try. Small steps. Tellio July 11, 2012, 7:07 a.m. In Reply To: Sheri Edwards July 11, 2012, 3:32 a.m. I went to your Ask What Else site and discovered your vocab triangle tool. I have been mucking about with it using the really fun iPad app Paper. Here is my digital playing about as I read Venkat Rao's stellar post "Rediscovering Literacy" on his always worthwhile blog "Ribbonfarm". I am always wowed by mindmaps and I really like Mindmeister and I love the care and respect that this map reflects. Thank you. I think that you have the beginnings of a curated and highly customized and useful site here. One aspect of curating that these mindmaps always seem to lack is a 'key' or a set of instructions on their use. Why do we need that? It seems like it should be self-evident what you should do with it. It's already a map that tells you where to go, right? Well...no. I hate to be so cliche, but the map ain't the territory and you need somebody who knows the territory as a guide. As a curated space it needs someone to narrate the story. I refer to this (and as a sheep farmer of long standing I think I speak with authority if not dignity) as the 'Goat Problem'. If you put the hay down where the goats can get to it, then they will eat it. There is no problem of curation with a goat (provided the hay isn't moldy). The problem is that kids ain't goats. Well, they are, but not the kids I am speaking of. I refer to children. Learning isn't food. If you put it in front of them it might not be entirely obvious that it is something they should eat. They need a curator to put it in the right light, to salt it a bit, to show them how to grab the chopsticks or the crab cracker. Teacher as curator, curator as teacher. So, Sheri (aka Annie Sullivan) guide us in your mindmap as to what to do, which path to trod first, what I can skip in the first reading, what is most crucial for n00bs and what for experts. It seems to me that curating shouldn't take that long, but I have been wrong before. Susan July 11, 2012, 7:42 a.m.
Wow, Sheri. Thanks for pulling this all together. I'm going to spend some time with your map. Of course we all have our own lens through which we filter, but this is a huge help. Sheri Edwards July 12, 2012, 3 a.m. In Reply To: Tellio July 11, 2012, 7:07 a.m.
Tellio, I have yet to digest all of the post "Rediscovering Literacy." It is very powerful-- expression and condensation! The mindmap is a "condensation" of our discussion, which is filled with questions to ponder -- to express. And your triangle of Literacy based on the blog also demonstates understanding through "condensation." I'm still trying to put an image to "instrumental." Appreciative, I get. KevinHodgson July 12, 2012, 5:30 a.m.
"... modern education is not designed to produce literate people. It is designed to produce programmable people. And this programmability requires less real literacy with every passing year. Today, genuinely literate reading and writing are specialized arts. Increasingly, even narrowly instrumental read-write literacy is becoming unnecessary (computers can do both very well)." It has me thinking of the term "literate" and what that may really mean. KevinHodgson July 12, 2012, 5:36 a.m. In Reply To: Sheri Edwards July 12, 2012, 3 a.m. I appreciate the mapping work you are doing and like that is remains a work in progress, as discussions unfold. One thing that popped out to me: In a traditional classroom, reading has primarily been the focus of literacy instruction and student work. In the realm New Literacies (or whatever term we want to use), writing seems to me to be at the heart of literacy (or so I claim). What your map reminds me is that reading skills are also changing with online environments (Don Leu has done a lot of work around this and http://www.learnnc.org/lp/pages/6958 at Learn NC a while back) and in our push to figure out the ways to engage our students as composers, we also need to redefine what it means to read. Just one of those "oh yeah" thoughts brimming as I toured your map. Tellio July 12, 2012, 7:15 a.m. In Reply To: KevinHodgson July 12, 2012, 5:30 a.m. I was brought up short by that same line! And if made me reconsider what literacy means. 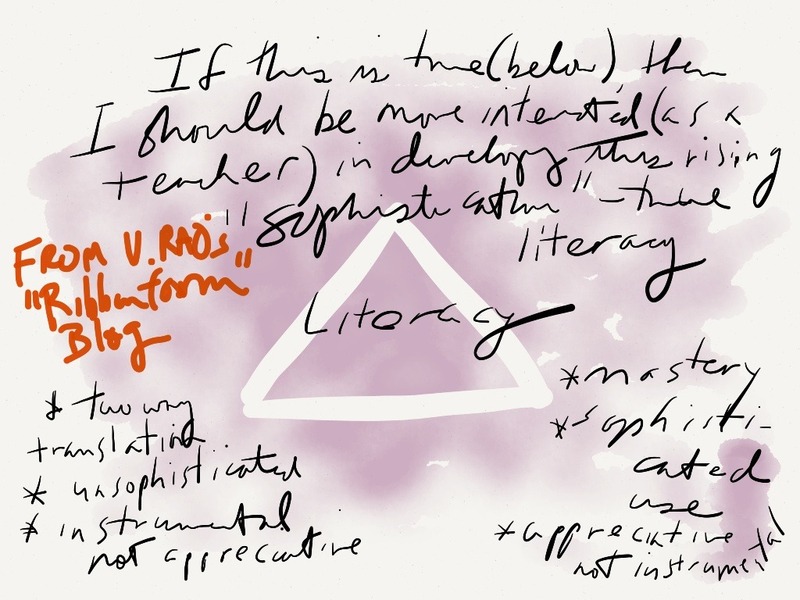 In fact I used a happy little tool that Sheri uses with her kids called a vocabulary triangle to get at the same conclusion--my definition of literacy (and curation for that matter) is both too narrow and too unclear. I think that means that digital literacy really is a whole 'nother beast. We use words to hold the world, but they are only approximate. When the world changes, then our words need to change as well (or at least the schema that underlay them). Words like classroom, teacher, student, principal, curriculum, textbook all feel a few degrees off the bubble. They still approximate the world, but less happily so all the time. For example, I have moved almost entirely from 'student' to 'learner'. Am I happy with that? No, but I reckon it's better than 'web eater' or 'text-o-raman'. Damn, we need somebody to be our neo-Shakespeare, unafraid to invent anew the language. I am personally thinking of changing my profession from teacher to learning concierge. As for Venkat Rao, I am reading his book Tempo on my Kindle right now. Very slowly. Here is a money quote for you. "Work is simply whatever we must do to get from one decision to the next." This predictable failure comes from taking a whole system like a forest and simplifying it with scientific principles into a monoculture. There is a fabulous image at the beginning of the post that makes this idea very clear. How does this relate? First, and specifically to our work here on curation: when we curate are we creating a legible path across the web at the expense of the illegible ecosystem of the web we extract it from? Are we in his words 'paving over the wrong cowpath'? Second, and in a larger context, do big scale curricular edifices like the Common Core simpify into stupid rows the particular genius of our learners, our learning spaces, and our communities. Sorry that this post took such an unpredictable lurch, but Rao has got my mind spinning these days and I just thought you might appreciate being on his own peculiar Tilt-a-Whirl for a bit this summer. Tellio July 12, 2012, 7:43 a.m. I love your intellectual tenacity and drive to push through the jungle of 'curation'. (How's that for some purple prose?) I really do imagine you with your Indiana Jones Stetson on and machete flying. Or maybe more on point, a programmer working her way through revision after revision of a tangled piece of code. Grand. Of course I have a few more suggestions that you can take or leave. First, I love the idea of using questions as 'curating path'. I think this is the idea behind Sizer's 'essential questions'. This is a very specific set of questions for a specific audience. Good curating to my mind. But there might also be a different set of questions for an audience who has not been on P2PU this week. I am not suggesting you craft those, but in our remix/mashup culture somebody else might take up the mantle. For example, I might have mentioned Robin Good's massive mindmap about curation tools. I asked him in a comment on one of his curated sites how we might approach the daunting task of diving into his mindmap. He pretty much said, "Dunno." Not good enough. I imagine 'instrumental' personally as a greasy hand on a wrench. Instrumental is always transactive--you want to get some bit of business done. Pencils and keyboard are the instrumental end of the hand that actually lives in our head. Classic left brain manipulation. I want to thank you again for imaging forth the work of this group. I will keep returning to your mindmap. I think I will copy it into my mindmeister account and fiddle with it a bit myself--a different fork in the road that will meet again a bit further down the road. We can swap stories then, too. Tellio July 12, 2012, 8:03 a.m. In Reply To: KevinHodgson July 12, 2012, 5:36 a.m.
An aside: in Gmail when you want to write an email you push the "Compose" button. Liz Renshaw July 10, 2012, 3:06 a.m.
Im not getting the video clip. Could you please post me a link to find this clip elsewhere? Im currently using IE would this be part of the issue as it's happening in other p2Pu courses. thnks very much for this help. Christina Cantrill July 10, 2012, 7 a.m. In Reply To: Liz Renshaw July 10, 2012, 3:06 a.m.
Sheri Edwards July 9, 2012, 5:07 p.m. I am Sheri Edwards, middle school language arts teacher in a rural area of Washington State. I live in Coulee Dam, WA. Because we live in a rural area with much poverty and a lack of bandwidth, digital equity to participate in the "fourth wave of writing" is an issue of importance to me. My students often, for awhile, have access to some Internet, some computers, some mobile devices; it is not a constant however. I agree with Maryellen in that my students have a narrow view of the information, tools, and possibilities with which they could create and join a local or global conversation. I am also under the pressure of "passing the test" and "raising the scores." On the other hand, my grandchildren are always creating and sharing in many forms, venues, and media, and do not feel the pressure of passing any test. So my experience follows what past research has shown: those who have (education importance, tools, educated parents) succeed, and those who have not (education apathy, occasional tools, less educated parents) do not succeed. So my work involves inspiring students to accept education, to provide the tools, and to be the encouragement for their exploration into educational endeavors. What have my students and I accomplished? We are a Google Apps for Education school, so we draft and revise on both paper and computer, as needed, including as a backchannel [ https://vimeo.com/19467599 ]. The eighth graders wrote novels in docs for Nanowrimo [ http://nsdedwards.blogspot.com/2012/02/nanowrimo.html ]. We are beginning to blog at edublogs [http://eagleswrite.edublogs.org/ ]; most students will have their own blogs next year. We participated in the first Flat Classroom Eracism World Debates [ http://eracism.flatclassroomproject.org/Eracism+2009+Archives ] for which I organized the judges. We have collaborated on a wiki with students in Memphis, TN, and created lessons on the Parts of Speech by collaborating with students in two different schools in Iowa [ http://askwhatelse.wordpress.com/2012/06/10/collaborative-projects/ ]. Two students designed and directed a Google Presentation / Wordle Veterans Project [ http://nsdedwards.blogspot.com/2011/11/writing-class-veterans-paragraph.html ] to honor our veterans. The science teacher and I develop team projects to integrate science and language arts. [ http://ppp.nsdeagles.org/ ]. Most of our projects began with a connection on Twitter ( @grammasheri ), and my goal since 2009 has developed from this premise: "Students today enjoy the connectedness of social networking; it is part of their very being. My goal is to bring my instruction into that cloud to teach the content required in ways that inspire online responsibility and ethics in this new, very public world." I hope that I can add to this conversation as I learn more to guide my students and peers into these "textured literacies." I bring practical experience from a challenging situation for which I continue in small steps of success for myself and my students. Tellio July 10, 2012, 6:46 p.m. In Reply To: Sheri Edwards July 9, 2012, 5:07 p.m.
Inspiring Sherri. I have commented upon via video on the strengths I see in your teaching. Here is the link. And if anyone else wants a look check below. I am still a n00b with ExplainEverything so bear with me. Sheri Edwards July 10, 2012, 9:52 p.m. In Reply To: Tellio July 10, 2012, 6:46 p.m. Thank you for the encouraging comments. I love the scene of the blistered dirt around a shrinking waterhole, the animals huddled together, surrounding what's left of their vital resource, easy pickings for predators. I also sometimes think the "whole testing nonsense" is "a way for the predators to weed out the poor," while its purpose is supposedly to level the field. No one learns that way -- the same thing at the same time in the same way. I think our "textured literacies" do provide differing fabrics. That could mean different tools -- even as Kevin and I discussed -- that makeshift work arounds we "who have little" must do to interact and create in ways those "who have" do. It also means those tools are part of the fabric -- video, audio, text, image -- they must coalesce into one purpose and meaning, and that requires careful thinking. And of course, it is the texture of thought, the personalized ways that we collaborate or consider how we compose our ideas to share our meaning. Although I think teachers should develop a repertoire of tech tools that provide varying ways to create and communcate, it is also important to learn along with the students because we can't possibly keep up. Both strategies allow the teacher to guide students to what you suggest they need: devloping their own toolbox from which to choose for the process and product. I so agree. I love Explain Everything! It is my favorite app also. Thanks for continuing the conversation in another model of digital writing for us to learn. I have already discovered several ideas to add to a website for teachers learning these tools, which I started last year. It needs updating, and you have helped with some ideas. http://www.askwhatelse.net/ Thank you. Christina Cantrill July 13, 2012, 8:50 a.m.
Christina Cantrill July 13, 2012, 9 a.m. In Reply To: Sheri Edwards July 10, 2012, 9:52 p.m. I also just wanted to note, Sheri, that I love the title of your website, "ask what else" ... a nice prompt/reminder to keep the questions ahead of us and an invitation for exploration. And I was thinking about Connected Educators Month coming up in August ... this might be a nice resource to share during that time and/or some of your other work that supports this kind of focus on networked learning for teachers and youth. Tellio July 13, 2012, 10:30 a.m. In Reply To: Christina Cantrill July 13, 2012, 8:50 a.m. I am using this tool in lots of ways including modeling to students what I mean by "close reading'. I am only now getting close to 'literate' with Explain Everything. It is, unfortunately, pushing my poor iPad 1 to the max. Sad, but it still works albeit slowly as it compresses and renders. Sheri Edwards July 13, 2012, 2:28 p.m. In Reply To: Christina Cantrill July 13, 2012, 9 a.m. Thanks Christina, I am a "lurking" member at this time, but my school is on the map! I will need to check into this in the next week. KevinHodgson July 9, 2012, 4:07 p.m. I'm interested in the way that technology and media inform choices that we make around writing/composing/creating. And as a result, I am intrigued by the choices that my students make when given choices around technology. One thing that I often think about is how mixing media can create something different -- the whole as different from the parts. I'm still thinking about this idea, and I realize I have trouble articulating what I am after here. This was a poetry project where I attempted to try my hand at creating something along these lines. I think the poems stand up by themselves, but it is the larger hyperlinked project that is really what I was after, and in fact, the hyperlink IS the structure, and path for the reader.. (Sorry, it seems like I lost the images that went with the poems, too. I guess I need to do a little more tinkering). Tellio July 10, 2012, 11:46 a.m. In Reply To: KevinHodgson July 9, 2012, 4:07 p.m. I think all poetry that dares call itself that begins in play. So in that spirit I have annotated your poem (some of it anyway, still working my way through) with Diigo's Group bookmarking function. Here is the public address for viewing and joining in the fun. I am not sure what your poem creates that is new. Perhaps it is similar to a palimpsest. Perhaps you need to define beforehand what the hyperlinking is intended to do. Is it the 'underwriting' that resides below the central poem? I have seen poets do this by writing a series of poems in a particular character's voice. Wendell Berry's Mad Farmer poems come to mind. Is it a web of larger understanding in this case the idea that the interior can be made exterior? I am thinking that the poems are not really detachable from each other without losing something. I think the structure you created bubbl.us all but guarantees that. I love that you consider poetry 'tinkering'. I am all for that. It is a craft and a game and way of making, digital in this case with all that this affords and all the adjacent possibilities that opens up. KevinHodgson July 10, 2012, 5:53 p.m. In Reply To: Tellio July 10, 2012, 11:46 a.m.
Never heard of palimpest before. I like that definion idea of "scraped clean and used again." The linking is the underwriting (another nice term) of the piece -- an invisible line of threads. Thanks for taking the time to play around with it. Tellio July 11, 2012, 5:43 a.m. In Reply To: KevinHodgson July 10, 2012, 5:53 p.m. Thanks for writing it. My response above does not give a real sense of how much I enjoyed it and respect the effort that obviously went into to writing it. New genres can take awhile to appreciate. For example, Twitter novels don't do it for me...yet. Again, thanks. Maryellen Ohrnberger July 9, 2012, 2:26 p.m. The "fourth wave of writing"? I'd like to hear more about that! I have had the privledege of working with some brilliant professors and young minds--our preservice teacher educators at ASU--and have learned much about what they perceive as the role of reading & writing in the adolescent classroom. As many of you already know, even though the millenials are digital, they do not necessarily see themselves as digital teachers. In fact, I am frequently floored by their narrow definitions and applications of digital tools and literacy in general. Of course, by the end of my course, they understand and recognize (even "try on") how digital media can be used as a learning tool--or even how digital media can become the learning in a traditional classroom space. I am also heavily into video games. I work with a whole group of people who make connections between education and games. We don't try to "gamify" education, rather see the potential for games within the learner's mind and space. Although much of my work focuses on digital practices, I dabble in all sorts of games, game theory, education, literacy, participatory culture, and the dicsourses connected with all of this. So right now, I'm finding myself deeply immersed in my own writing about literacy, learning, technology and education, as well as thinking about the traditional writing and digital writing young students can and will bring to the classroom. Currently, all of my brain power is focused on teasing out how a teacher might respond to students during the writer's workshop who choose to push the envelope of writing--in presenting preservice teachers with writing scenarios: students whose topic is the same, but the media are different. From traditional print texts (ala 3-Paragraph essays) to Glogsters, how do teachers react to, respond, to, and teach writing within these mediums? What challenges do newer forms of digital media bring to the writing process heretofore simplified or even removed from the textual process of paper & pen? This is what I'm currently doing and thinking about...what are you doing and thinking about? Tellio July 10, 2012, 12:26 p.m. In Reply To: Maryellen Ohrnberger July 9, 2012, 2:26 p.m.
You have given us much to consider here. I want to focus on the end of your post for now. In italics you write about how teachers react to teaching writing in new media. I am struck by the watershed that teachers straddle today. That stretch between the analog and the digital can and has been made worse by the inequities in schools today (money, bandwidth, access to devices). A very recent Pew study points out that "more than half of all adult cell owners now use their phones to go online as of April 2012. " What is most astonishing about the survey is that they asked how many used their phones mostly for internet access. "For adults 50 or older, 11 percent of cell Internet users use their phones for most of their access. For adults 30 to 49, it’s 29 percent. And, as mentioned above, it’s 45 percent for 18- to 29-year-olds." They didn't ask anyone under 18 but my wild guess might be that most of them are joined at the brainstem with their phones. OK, I don't even know where to begin revising how I teach freshman composition to my incoming class this fall. I had inklings of this with my own informal surveys. Last year I had to add a question because of conversations I have had with students, "How many of you have written all or a large part of a paper/essay on your cellphone?" My small sample had them at about 15% of users, but if the Pew survey is to be believed that will go way up over last year. So one of my challenges is this: how do we use mobile tech in generating the various types of writing new and old that we are expecting our students to produce? I will tell you right now as the proud owner of a feature phone, I am not ready. I am just like my students, hard pressed to pay for the technology I have much less ready to lead the way with iphones or android devices. That's what I am thinking about in response to your post. I am open to any edupunk ideas anyone has about the how I can equitably adopt the new digital literacies. Maryellen Ohrnberger July 10, 2012, 2:11 p.m. In Reply To: Tellio July 10, 2012, 12:26 p.m. Thanks for getting the conversation started in this! Everytime I am given an example of how teachers are using digital media--it's usually a full-blown, large scale example, and by then, it's difficult to see how the seed was planted--how the kernels began. One idea I am playing with right now is to redefine what we consider to be acceptable forms of genre when it comes to academic work. We STILL honor the essay over all other forms of communication, but as we see, a blog can be a better argument device. Between hyperlinks and commenting features, the writing a student produces could potentially develop into a study and a thought process much deeper than an isolated paragraphed text. So maybe that's a place to start, with blogging. My current project is to develop these ideas and test them in a virtual world: preservice teachers will actually be presented with "virtual students" who will push these boundaries. They will need to conference and respond to texts incuding essays, blogs and even Glogsters. I am hoping to gain insight into how 20-somethings, our wanna-be teachers, think about and respond to these issues. Unfortunately, my hunch is that they will be as confounded as you and I and any other teacher has been: even though they may use mobile devices and digital media, when brought into what has been traditionally seen as a less-than-digital sphere, what will they do? How will the "genre" affect how they can react to and teach the students? Will they get sidetracked by the digital and find themselves confronting their own beliefs about what's an acceptable form of writing? I'm so excited by these questions--but then again, I'm an uber-geek. Some resources for you... to get thinking, and perhaps, get started! http://dmlcentral.net/ I follow this site more to be a part of the conversation rather than get idea, but if you keep digging, that stuff is here too! http://www.macfound.org/programs/learning/ Again, another "thinking" site, but it's replete with movers and shakers in digital media & learning. Finally, where do you teach? Are there universities nearby who are doing anything with education and technology? I know that where I am, there are scores of opportunities to get teachers connected with the things that are happening...they NEED classrooms and willing thinkers!!! Susan July 10, 2012, 4:54 p.m.
Sheri Edwards July 10, 2012, 5:04 p.m. In Reply To: Susan July 10, 2012, 4:54 p.m. I think that many students would appreciate the use of multi-media to express their ideas and understandings. Feedback from peers, the teacher, and commenters invited in from a social community would provide a personalized assessment, rather than a grade. Student own reflections on each continuing or successive project would indicate their choices to improve from past pieces of work. I like the idea of "no grading;" just continuous learning by students and teachers. Do you think we are in a transition phase that might lead to personalized or personal learning and growing? Susan July 10, 2012, 5:14 p.m. In Reply To: Sheri Edwards July 10, 2012, 5:04 p.m. I do, Sheri. More than ever, I believe connections and conversations matter. Giving students a real audience and allowing them to determine form and structure for their composions helps them learn independently and at their own speed. Andrews and Smith point out the goal is growth, not some arbitrary product. Lots to think about. KevinHodgson July 10, 2012, 5:39 p.m. I am interested in your work around video games, Maryellen. Can you tell more? I've been doing video game design with my sixth graders and how to connect design theory with writing process theory. KevinHodgson July 10, 2012, 5:46 p.m.
Maybe in an ideal world, Sheri ... but I don't think we are in a "no grading" setting in public schools and even transitions to standards-based assessments (and away from traditional grading) is fraught with complications, and concerns. I say this from a personal level as a teacher, and as a parent. While I would love to say my students and my children would be motivated soley by "doing well," I think the reality for many students is very different. Which is not to say that everything I do is graded or assessed. And I am all for choice. Sheri Edwards July 10, 2012, 5:48 p.m. In Reply To: Susan July 10, 2012, 5:14 p.m. I think so too. It is difficult in this transition, due to testing and curricular requirements. Students should be able to write for authentic purposes and choose the products that best fit that purpose. Several audiences may be involved, so while the purpse may be similar, the genre -- or the product -- may be different. I'm going to think about this as I plan for next year. What questions can I ask and on what problems could we consider that will engage students to choose to write well in many forms. And by writing, I think I mean " create to communicate." KevinHodgson July 10, 2012, 5:50 p.m.
One of the ideas that I keep pushing up against is how the tools also limit us as writers. While on the surface, some things seem to have great potential for stretching us as composers of media and writing, the lack of flexibility and barriers (often put there by cost, I suspect, or technology limitations) creates a sort of glitch in agency of the writer, don't you think? We strive for workarounds, and re-envisioning a tool for our own purposes, but still ... there are often limitations. I guess that's what drivers computer programmers, right? Make something that works for you. I wish we were all programmers. Maryellen Ohrnberger July 10, 2012, 5:54 p.m. In Reply To: KevinHodgson July 10, 2012, 5:39 p.m. So I get to work with them (Betty is my advisor and Jim's on my doctoral committe), and be a part of the action. Recently, they opened the Center for Games & Impact (http://gamesandimpact.org/) and I am specifically involved in building/designing a virtual world game/experience for preservice teacher candidates. I want to hear MORE about how you came to games and how you brought them into your classroom! Sheri Edwards July 10, 2012, 6:07 p.m. In Reply To: KevinHodgson July 10, 2012, 5:46 p.m.
Kevin, I teach those same kids who lack motivation, but is that perhaps because of a lack of exposure to what they could be interested in, and therefore be more engaged? And for many of my students, they are exposed to situations and media that does not elicit hope and a dream for a different future. Without that vision, there can be no plan. And without a plan, why try? How does "school" help? The kids I teach require much more time to build a background from which they can move into their own choices. And time is something we don't have in our struggle to raise those scores. I need time to hear them and learn from them. Relationships are key. If I want them to write with passion from their heart and learn how to learn, then the students and I need to build that community. And moving away from grading is one important part of that. A community doesn't grade; it converses and connects; it encourages and interacts. It's the feedback that keeps a community growing. We always feel pulled apart. "Is this for a grade?" "Do I have to do this?" I have to teach those small objectives, yet I even more I want them to create, to analyze, to manage the ideas, to synthesize, and to turn the topic into something important to them and to others. "We must learn this." "It's on the test." Students and teachers are pulled from what's important about learning, and about communicating, which is writing in all its forms. So, finding the balance is why I'm here. And how can I move the transition along so there is a transition? Sheri Edwards July 10, 2012, 6:18 p.m. In Reply To: KevinHodgson July 10, 2012, 5:50 p.m. Yes, I agree. I'm fortunate to have access to some technology, so we can do many things, but probably, as you say, not quite what the students want to do. For one thing, the time it takes to do some of that is way beyond the scope of my day, and most of my students would not stay after school to finish. So I like our work arounds, and we should congratulate ourselves, and our kids for accepting it. That's a critical part of learning to solve problems -- creating what could work instead. Our kids would love to make videos, and I have iMovie, but that would require much more time than we have in writing class. So students write skits on their topics with their peers, and perform them in sectins in Photo Booth. Then we stitch them together in iMovie -- or a Keynote presenation. We can do all of that -- writing, performing, finishing -- in two class periods! And it is these creative projects that motivate the students: These are the tools we have; how will you use them to express your ideas? But. Without access, teachers and students are stuck. Sheri Edwards July 10, 2012, 6:34 p.m.
Oh I love your game project! I read your reflection, and I have found in my projects integrated with the science teacher, that the science content did not transfer into the writing, and the final writing projects were also filled with those silly errors, just as yours did. Yet, I plan to continue the project with more scaffolding and mentor texts to help them. How long was your project? Did you use the basic teacher account or premium? Tellio July 10, 2012, 7:39 p.m. In Reply To: Maryellen Ohrnberger July 10, 2012, 2:11 p.m.
it's difficult to see how the seed was planted--how the kernels began. I agree and have a philosophy that starts with small incremental changes that mount up. I also believe in David Weinberger's idea of tech as repertoire--or as he puts it, 'small pieces loosely joined. Yes, and this is in the form of microblogging. curating, and full fledged blogging along with RSS. Pushing gamification a bit hard aren't they? Who funds MacArthur? Finally, where do you teach? Are there universities nearby who are doing anything with education and technology? I teach composition to at-risk freshman at Western Kentucky University, I am also tech liaison for the WKU Writing Project. Many folks are doing things, but not much appears to be getting done. Lots of dithering over social networking tools, common core standards, and more (or should I say less). Schools of Ed in the state are failing our ed students in digital literacy except in areas like science teaching (SkyTeach) where a very few reap tremendous benefits while the remaining teacher candidates are left to fend for themselves. Sound familiar? I know I sound negative here, but we do no good faking it and hoping all will be well. It ain't well in my home state. Tellio July 11, 2012, 7:31 a.m. I am struck by the phrase "how the tools also limit us as writers". The word I am zeroing in on is 'tools'. Our default thought for this word is something that is instrumental and in hand. Whether it is a hammer or a keyboard, a tool is something that extends us into the world. But ideas are also tools. For example, the idea of narrative as conflict and resolution is instilled as a tool for writing. Just look at Hollywood scripts (but not too closely). Yet as natural as that tool seems to us, it limits us. That fact was driven home to me recently after reading about 'kishōtenketsu'. Apparently one can have plot without conflict. To echo the Dude in "The Big Lebowski", "I did not know that." It is a stock writing tool in four panel manga. Do you get the feeling that everything you know is wrong? Or at the least dangerously close to it? Freytag's pyramid is not a universal. My point is that our tool biases originate from and are deeply embedded in who and what we are as human beings. Live it or live with it, I suppose. Susan July 12, 2012, 5:34 a.m. In Reply To: mratzel July 11, 2012, 8:59 p.m.
Marsha, I'm no expert on the topic, but you might want to read this. I love when you talk about passion and having a stake in the learning. So important. And you are also right about working with folks outside the classroom. "writing becomes their conduit when they're trying to tell me something about what's important." You've nailed this, Marsha. I think I would have loved being one of your students! KevinHodgson July 12, 2012, 5:39 a.m. In Reply To: Susan July 12, 2012, 5:34 a.m. I'm all for "composing." And I have read that article about programming and literacy, and wonder about it, and how to bring more of that expanding sense of literacy to my sixth graders. Here, you run into the problem of: how many teachers can code? (never mind, teach coding). And so how do we bring that kind of "textured literacy" into the classroom other than a computer programming course? That's the key. To see these kinds of composition as part of literacy, and not as some separate task or skill. Susan July 12, 2012, 6:42 a.m. In Reply To: KevinHodgson July 12, 2012, 5:39 a.m.
Kevin, it's interetesting to me that my start in technology came in 1995 when I took a Basic programming course to recertify in teaching. The course was listed at our local university as one that would qualify. Not knowing any better, I jumped in. Within three weeks I was way over my head and frustrated. Yet, when I finished, I wrote a program that averaged grades! Then I moved to learning DOS, which helped me tremendously when I worked on PCs. And finally, the html I learned gave me confidence to play around behind the scenes with my wordpress blog. I agree not many teachers (especially those like me in humanities) tackle programming. But I loved learning in new ways--the logic pushed me to think about organizing writing differently as well. You might be interested to see what my colleague is doing in her PhD program in Rhetoric. They are asking her to work with design/code on her blog. She is reflecting as she goes, and just returned from Ohio's New Media workshop. Perhaps for students the textured literacy begins in the creation step and having to learn to program these tools/apps to integrate them into their work. I wonder. Susan July 12, 2012, 7:43 a.m. In Reply To: Tellio July 10, 2012, 7:39 p.m. I see exciting work happening in the DTLT dept of the University of Mary Washington in my hometown. (ds106) Makes me wonder how it might affect the School of Ed there or if it already has. They plan to hand out domain names to incoming freshmen this year. And I love the way the entire school seems to have embraced sharing and connecting across their blogging platform. Thanks for all the links/articles you are providing, Tellio. What great resources. Tellio July 13, 2012, 7:03 a.m. In Reply To: mratzel July 12, 2012, 9:13 p.m. So much of good teaching involves finding a way to 'entune' by being mindful of your students. That's why I loved teaching drama in the classroom. It was all project-based and skills-centered, but in the end my learners had maximum choice and my job was to make sure the kids got to do what they wanted. It seems obvious that we need to do this or at least compromise and give kids some of what they want. It isn't impossible to make it line up with what the powers-that-be want. Wonderful...we give them the time to work out an answer and then let it happen again and again. This is the model that is a natural one--learning to stand for example is the result of lots of iterations of trying to stand. Not trying to stand perfectly, but just getting to 'balanced'. Allowing the time for mastery satisfies one of the greatest needs we have as learners--the desire to get good at something important to us and others AND then to be acknowledged. I love giving students time to work on something worthwhile. Sometimes it seems as if every gear in the machinery of schools works against that, but we must give them time. Time for the connections that drive natural learning and literacy. And lucky for them a feedforward loop for a second year and lucky for you to see next week. Thanks for the comment and the nice model of teaching you have shared. Tellio July 13, 2012, 7:08 a.m. In Reply To: Susan July 12, 2012, 7:43 a.m.
What Jim Groom and his many collaborators are doing is nothing short of a new school model. I don't even think the word 'school' does justice to the connections he and his co-learners are making F2F and online. Thanks for bringing this up. Susan July 9, 2012, 1:06 p.m. I am a retired middle school language arts/journalism teacher living in Fredericksburg, VA. I've recently opened a writing studio, where I offer workshop-style classes for adults and young people. I now spend my time thinking, talking, and learning about writing--what could be better? Though I never participated in the NWP, I've followed it for years and rely on the resources in my work. I plan to attend other writing retreats now, and I completed one last month here. Christina, so funny you mentioned drawing. I wrote about the connection between taking an art class and writing a few months ago. Now I find that one inspires the other. I've been thinking about multimodal and textured literacies as well, lately. I hadn't heard about TL until I read the interview with Kathleen Yancey, who talks about preparing our kids (and ourselves) for the "fourth wave of writing." All fascinating stuff, and I look forward to learning from you all here. Christina Cantrill July 10, 2012, 2:29 p.m. In Reply To: Susan July 9, 2012, 1:06 p.m.
KevinHodgson July 10, 2012, 5:40 p.m. I like that phrase of "textured literacy" since it captures a lot about the depth of writing when other media components are pulled into the mix. Susan July 11, 2012, 5:18 a.m. In Reply To: KevinHodgson July 10, 2012, 5:40 p.m. Yes, and it's a term that embodies some of the complexities we now face. But I don't mean that in the negative--I love the varied layers of writing/composing we are now exploring! Susan July 11, 2012, 12:52 p.m. In Reply To: mratzel July 11, 2012, 12:37 p.m. Yes, that's exactly what I was talking about--a melding of text, audio, video, and visuals. Our kids are writing in so many ways outside the classroom. Traditionally, we haven't considered this writing. And yet, we adults are doing exactly that kind of writing/composing as well (and dealing with the same learning issues). So research is now focusing on redefining literacy and trying to help us all understand what this means. And then the complicating question is what this means for standardized testing. I love the idea of shared writing, the collaborative stuff we can do in google docs, the social justice unit I did with my friend in Ontario where the kids researched and presented together. How does teaching/learning change with this new focus? In what ways should we be developing a new writing model for teaching? Many people have already talked about substantial efforts here, both in K-12 and higher ed. It's exciting to see. Christina Cantrill July 9, 2012, 11:37 a.m.
I’ll jump in and add my own response to this prompt … and in doing so I just wanted to highlight that in responding you are welcome to do so in whatever way you are most comfortable -- write prose, brainstorm notes, mindmap, draw, etc. Vignettes could also be a helpful way to get started too. Oh, and please introduce yourself when you share! I forgot to mention that too <blush>. So here I go … my name is Christina Cantrill. I have the great honor of working for the National Writing Project and with the teachers who are connected to this network. I live in downtown Philadelphia, my hometown. I travel for work and enjoy seeing new places even as I stay rooted for the most part. For instance, this weekend I was in Asbury Park, boyhood home of Bruce Springsteen, among others. A brand new town to me and an interesting place to visit (as well as good escape from the heat). Inspired by the sky, surf and sand and that band up there on the boardwalk, I remember the soundtrack of childhood road trips – Simon and Garfunkel live in Central Park, “Love is a Rose” by Linda Ronstadt and “Take Me Home Country Roads”-- played over and over again. Frank’s video is of interest to me too in this conversation about writing and literacy learning as he collaborates with a friend, Michael McCarthy, who draws in real time to demonstrate his ideas and make visual, textual and aural connections. Tellio July 12, 2012, 8:28 p.m. In Reply To: Christina Cantrill July 9, 2012, 11:37 a.m. I finally worked my to the bottom of the comments, the foundation as it were. And there you were. I have been taking the Google Search/Research online course and immediately thought of your drawing when I was looking up beach shots of Asbury Park and using the color image filter. Here is the link. I suppose that is both a writing and a literacy learning (search literacy) connection simultaneously. Addendum: music got me thinking about Bruce and the Big Man (god rest his great soul) and I found this Springsteen/Donna Summer mashup (sort of) on Soundcloud. Summertime and gins and tonics and surf foam on the beach with a light breeze.